A delicious A grade Tieluohan tea from the Wuyi Mountain. This roasted oolong was harvested in June 2009. In his long life as a religion teacher, Lord Buddha Gautama turned the Wheel of Dharma three times. In the first turning, he taught about the pervading nature of suffering. He taught how one could obtain liberation by practicing proper conduct and meditation. It was an amazing time to live in. Many Indians achieved a high level of realization - a state which is later known as Arhat. Now you are going to ask - why is this tea called the Iron Arhat? There are thousands of identified Wuyi tea species. The most celebrated are known as the Famous Tea Bushes (Mingcong Qizhong). Tieluohan tea is considered as one of the five most famous teas. Not only that, he has the longest history. Like many Wuyi oolong teas, he is remembered for his medicinal quality. 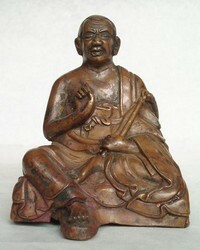 He cured so many illnesses that he is said to have the miraculous power of an Arhat. In 1890 and 1931, pandemics broke out in Huian county. Twice he was found to be an effective remedy. Some tea experts claim that even today, he is an effective anti-inflammatory and detoxifier. The dried leaves are broad and muscular, possessing the tough external of a warrior monk. To experience, first rinse in hot water to remove the ":fire". The liquor reveals an exquisite fragrance that is strong, subtle and long. 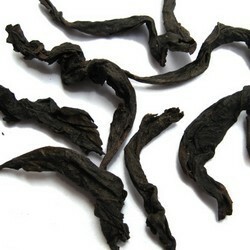 The taste is smooth with no astringency, is rich and full-bodied. Savor every cup. This is an A grade, so he peaks early at the second infusion. When you are done, pour out the wet leaves and admire its brownish green color. Can you spot the Iron Arhat?